How Much Money Can You Make Owning Noodles Stock? In one of the best IPO results of the year, the first restaurant IPO of the year, Noodles (NDLS) raised almost $100M and stock price more than doubled from its initial pricing at $18 to close at $36.75 on its first day. The Noodles CEO, Kevin Reddy, came from Chipotle (CMG), at an earlier stop in life. Is Noodles the new Chipotle? · Fast casual operators, new buildings, new food types and popularized styles. · Average Annual Restaurant Sales in the $1.2M to $1.4M range. 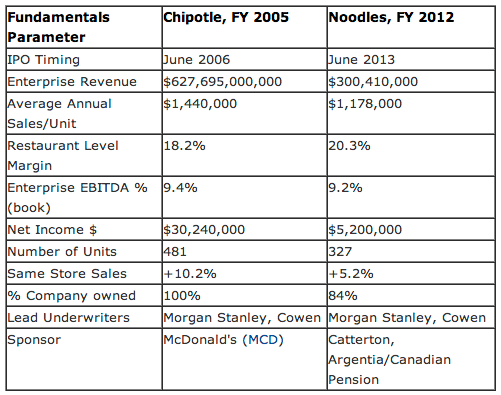 · Solid restaurant margins - Noodles now actually exceeded that of Chipotle in 2005 by 210 bpts. · Totally or primarily company operated model. Noodles' success demonstrates there is investor demand for new restaurant offerings and validates fast casual investor demand. I understand NDLS was twenty times oversubscribed. Catterton, Morgan Stanley and Cowen did a nice job. The issue to keep in mind is the United States consumer space is not the same as it was in 2006. Recession, fundamental changes in population, income, eating and dining preferences, commercial real estate site characteristics, and more U.S. restaurants in operation each year make for a more difficult 2013 and out conditions. Noodles must deliver good quality, service, cleanliness and price/value, in a differentiated fashion, with good corporate stewardship and continue to build connections with guests, employees, investors and other stakeholders via its culture. Mathematically, as it expands, it has to think a lot about occupancy costs. NDLS occupancy costs are now 9.9%. Chipotle's was 7.6% in 2005. Site supply is tight. Many legacy brands, the real first movers, like McDonald's and Dunkin' Brands (DNKN) got the early best U.S. sites. Restaurants economics was built on 6-8% rent, but some restaurant operations are facing 15-20% rent for some sites. Too much push for too fast expansion will test the rent leverage especially for a $1.2 million sales concept. The imputed IPO valuation from the NDLS IPO is already $800M, or an EV/EBITDA multiple of 26.6X. That's rich. But it's just the first day. I hope the pressure cooker investment world will take a break and give them a chance to grow smartly.